SPRING LAKE TWP. — Chain saws whirred at the Spring Lake Township Cemetery on Wednesday afternoon, slicing through ice-frosted branches and tree trunks. Although the scene of trees coming down is often aesthetically disturbing, township officials say it's a necessary project due to disease and the potential for human injury. The township is paying Integrity Tree Services of Grandville $75,000 to remove 95 trees and trim another 20 at the cemetery. With the blessing of the Township Board, she hired an arborist to inspect cemetery trees on both the east and west sides of Fruitport Road. The rear portion of the cemetery’s west side, near the intersection of Beach and Railroad streets, proved particularly problematic, according to Boersma. Boersma said liability concerns are the main reason for the tree removal project. Spring Lake Village resident Janet Tyson is upset about the tree removal. 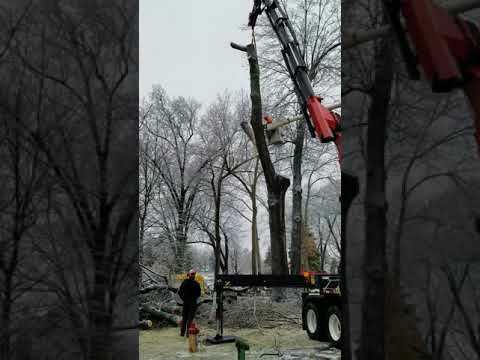 Wednesday afternoon, Integrity Tree Services employee Joe Hayden worked the remote control for the bucket that hoisted co-worker Milo DeVries to the top of a tree on the west side of the cemetery near Fruitport Road. Besides trying to work around gravestones, Hayden said the weather has been challenging, and depending on future conditions, the project could be completed in about two weeks. Boersma said she has been planning for this day for many years, and the Township Board has authorized spending $2,000 per year on new tree planting. She said an arborist will be keeping an eye on the cemetery’s trees.